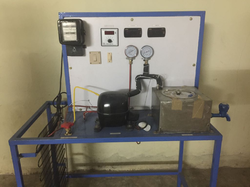 Providing you the best range of refrigerator test rig, water cooler test rig, window a/c test rig, split a/c test rig, cooling tower test rig and vapour absorption refrigeration test rig with effective & timely delivery. To determine the COP of given plant. 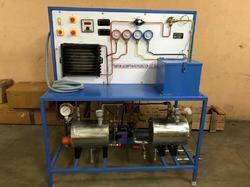 The apparatus consists of a compressor, condenser, dryer, digital temperature indicator, sensor, pressure gauge & vacuum gauge. Eco-friendly R 134A is used as refrigerants in our Air Conditioning Test Rig. 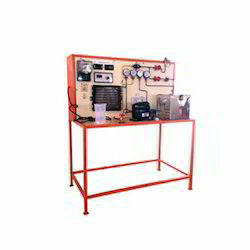 Our Air Conditioning Test Rig is highly useful in conducting experiments on a vapor compression air conditioning unit. 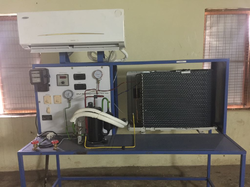 Evaporator: - Material: S.S.Tank ,(Sealed Type) Capacity: 5 liters. 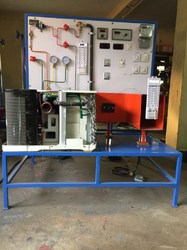 Electric supply: Single Phase, 220 V AC, 10 Amp. Vapour Absorption Refrigerator” is a self contained refrigerator working on absorption technology. In the absence of a compressor or pump, the circulation takes place by density difference. The system is pre-charged with three fluids namely water, ammonia and hydrogen. Hydrogen is used as an “inert gas” and does not undergo any phase change and heat transfer processes. Its purpose is to keep the pressure of the system constant. 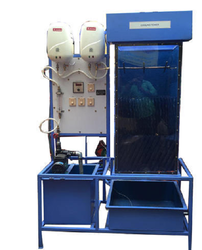 It uses an electrically operated generator, where, the ammonia vapours dissolved in water are separated and pure ammonia vapours enter the condenser. In the condenser, the high pressure vapours reject its latent heat to the surroundings and get liquefied. The liquid ammonia expands through expansion device where its pressure and temperature is reduced and cold low pressure vapour enters the evaporator where it absorbs heat from the space to be cooled and then vaporized ammonia absorbs in water. This strong solution then enters the generator and the cycle repeats. Looking for Refrigeration & Air Conditioning Practical Lab ?